A Canadian geoconsultant saves his mining clients millions of dollars by using Surfer and Voxler to accurately map the size, shape and orientation of subsurface mineralization zones. He plots and analyzes a variety of geologic data sets and then visualizes the results in 3D to recommend where his clients should – and shouldn’t – drill additional core holes. “I tell them to drill here and not there,” said P. Geo. Ricardo Valls, an independent geoconsultant based in Toronto, Canada. Some exploration projects involve drilling dozens of core holes that can each reach depths of 1000 meters. At an average cost of $200 per meter, eliminating the drilling of just a few holes can easily save a million dollars. For Valls, that’s a typical day at the office. He explained that drilling some holes during exploration is a necessity because the cores brought to the surface contain valuable data about the minerals below. But in many cases, drilling takes the place of subsurface mapping, and exploration companies simply keep drilling holes until they reach the perimeters of the deposit or they run out of money. Valls prefers to use Surfer and Voxler. He is a true believer that drilling should not be used for exploration, but for verification. Other visualization and analysis packages exist, he added, but they cost 30 times more than the Golden Software products. In a typical project, he collects samples of soils, rocks and plants from the surface and tests them for trace elements and major oxides. He creates a 2D geochemical map in Surfer visualizing the distribution of these elements across the surface of the project area. He often imports publicly available digital elevation models directly into Surfer to add terrain and landforms to the scene. Analysis tools in Surfer allow Valls to present the geochemical data for easy interpretation. A Variogram tool, for example, generates an anisotropic map of trace elements that indicates the orientation of the mineralization below. Next, Valls uses Voxler to render a 3D subsurface view of the mineral deposit based on geochemical analysis of the core hole logs. Voxler analysis tools enable the geoconsultant to grid the metal content and grade of the core samples to estimate the concentration of mineral in each of the selected grid units. Grid sizes can be changed and reanalyzed with a few mouse clicks. Voxler can interpolate these calculations of mineral content between core locations across large areas. Finally, Valls imports the geochemical surface map from Surfer into Voxler, which integrates the 2D surface information with the 3D subsurface interpolations to generate an extremely accurate map of the deposit. 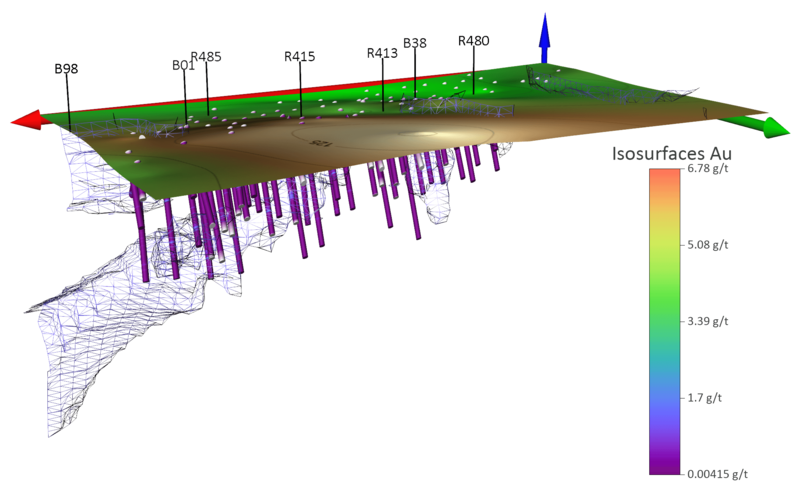 This 3D map represents the location, orientation and horizontal and vertical perimeters of the mineralization zone, along with its metal concentrations – critical inputs in calculating the overall value of the resource. 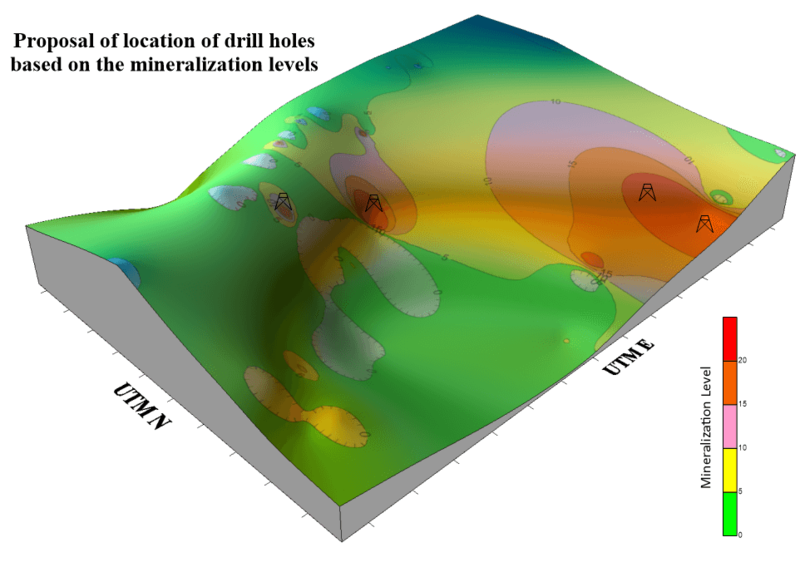 Valls uses the 3D mineralization map to recommend where additional cores should be drilled. He has nearly a 100% success rate of intersecting mineralization – thanks to Surfer and Voxler. The capability of Surfer for integrating multiple layers of information is very useful to better locate drill holes. 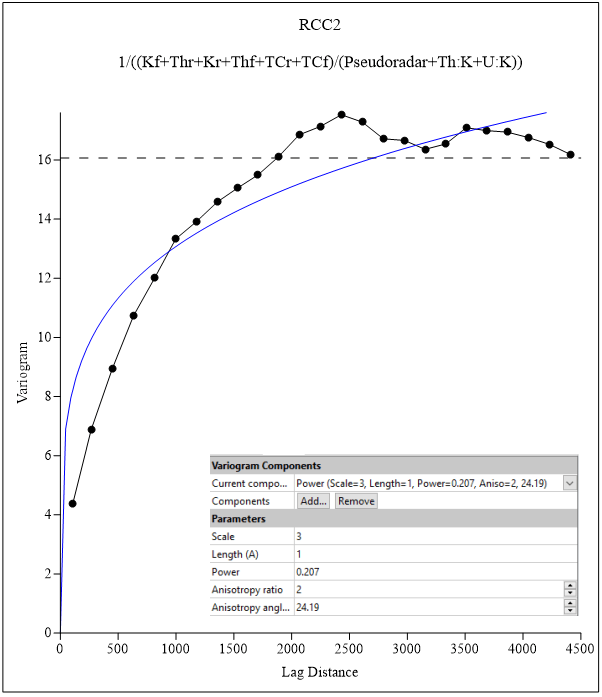 Variograms help define the internal anisotropy of data to obtain better graphical representations of your anomalies. Working 3D model of different envelopes of mineralization using Voxler.